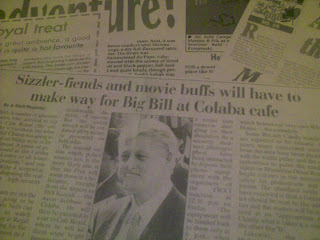 Cafe Royal's claim to fame is that Bill Clinton went there during his visit to India when he was the President of the USA. They have a sketch of him on their wall. Kainaz treated me to dinner there soon after Clinton's visit. They haven't put my mug shot on the wall though. Clinton had come to meet some of the prominent next generation folks of India at Cafe Royale. Kainaz and I went to Cafe Royal last week with our family elders in tow. Cafe Royale is famous for its sizzlers. I never got the point of sizzlers. Is it for aesthetics? 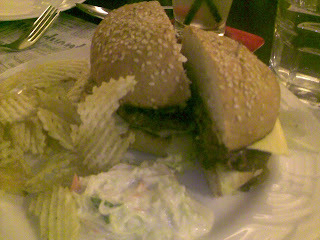 Or a bit of razmatazz?The Vegas touch to food? Or does having your food sizzle on your table add to the taste? How were the Cafe Royal sizzlers? I ordered a hamburger steak, well done. It was nice and mushy. 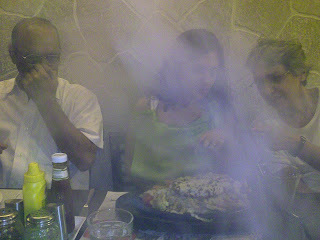 Mama (K's uncle), who is a vegetarian, had his first tryst with a sizzler. 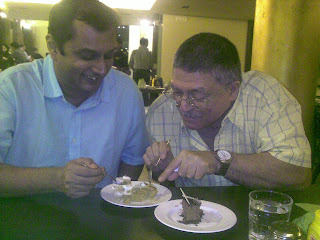 I think it had a paneer (cottage cheese cutlet) sizzler and he quite like it. But I'd never seen Kainaz's eye light up when she had a sizzler like it this time. She had a lamb kebab sizzler. I took a bite and realised why. It was astonishingly soft and creamy, angelic... the sort of dish which makes you regret your own order. And as I said mine was quite good itself. 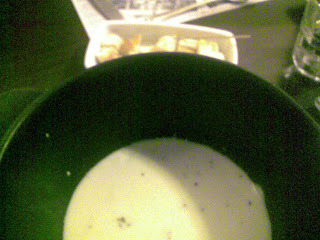 It was an evening of discoveries and my mom in law who asks us to order anything with 'lots of cheese' got a fondue. It came before the other orders and all at the table poked in skewers with bread into the cheese in wonder as I coached them on fondue. I am very overbearing at the dinner table. Luckily our aunt shared some of her sizzler with my mom in law who still grumbles about the 'excessive' amount of vegetables in the sizzler. Did I mention that I am married into a Parsi family? The only community who can give us Bengalis a run for our money in the non vegetarian stakes. They also have sandwiches, bagels and stuff. My father in law who is a sandwich fan ordered a steak burger. I was going to ask him how he found it for you. But the huge burger was gone before I could ask him. I guess that pretty much says how good it was. There cheese chilly toast was nice and a bit genteel as it had herbs and paprika instead of just green chillies. There was an awkward silence after the food got over. Who would bell the dessert? All eyes looked to the son in law and I dutifully got up and led my father in law to the dessert counter. 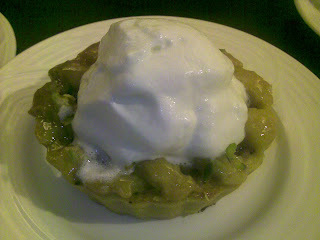 I am fond of apple desserts and chose an apple pie which came with a scoop of vanilla ice cream. My father in law is a chocolate person and chose a chocolate almond cake. 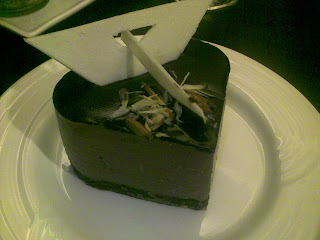 The chocolate cake was mousse based and had a nice nutty yet restrained taste to it. It had just the right balance of chocolate and sweetness. The apple pie was one of the best I had. The dough was soft and not stiff. The apple mix was very seasoned and brought up visions of moms in American sitcoms with red and white checked aprons. The warm pie blended beautifully into the cool ice cream. My pa in law, as I said, is a chocolate person. But he is an ice cream addict too. He is not allowed desserts on normal days now. So he kept lunging for my apple pie as the scoop of vanilla attracted him like a bee to a honeycomb. I couldn't do much. This is the man who gave me his daughter's hand after all. And then we all rolled out of Cafe Royal looking like the proverbial Cheshire Cat. The menu card says that they were opened in the early 1900s. It was an Irani cafe which has evolved over time and is now a sizzler place. 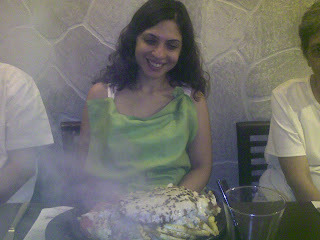 The sizzlers cost about Rs 250 -300(6USD) each. And as Ruth of on my plate would have mentioned the loos were gender aligned and quite nice and clean and arty too. I could never figure out where Sizzlers came from! Are they American? The very thought of paneer or veg cutlet sizzlers is such a put-off, man. How do people eat them? And that apple pie had my mouth watering! I've been to Cafe Royale only once before they got renovated. Had an alfredo (or was it pesto) pasta & loved it! Never saw the point of a 'sizzler'. You wait for food that you ordered and is now in front of you. No, you cannot have it till you been through some silly pyrotechnics! If I want entertainment, I will go to a circus. Oh...and I hate that thing of announcing to the whole restaurant what you ordered. Not to mention, that mad rush to save whatever you are wearing from those over-enthusiastic oil stains. Scarlett...spare a thought for the few vegetarians who do come on the site despite the kosha mangsho picture. Though i hope they know the damage they are doing to the forest cover. No no! I never said I don't like sizzlers. I like them. My favorite at Yoko's/Kobe's is the Chicken Sashlik sizzler. Hi Scarlett, even I like sizzlers. Just don't understand the point of them. Kobes is a favourite of mine. Now there is a yokos at Hill Rd too. Frankly, i wonder if many vegetarians read finely chopped. Most of the stuff here is quite sinful. I agree with Rahul. A sizzler is a circus! Besides, its not fun when you are famished and you wait for the food to cool down enough so that you can eat. However, the only sizzlers that I really like are the ones from Jugheads/Pop Tates. They serve the sauce separately too and are inexpensive - average price being Rs 190. I had ordered a Sirloin Steak at a posh restaurant in Sunnyvale, CA. Never understood the bland taste and the large plateful of greens. I wanted the steak rare but she persisted in taking the order for medium. My Swedish friend got a rare steak tho!